Does this look like one of the famous sandwiches of all time, an iconic hamburger, a cornerstone in the history of New York City? Well, it is. This is the Cadillac, named such by Nat King Cole, from the recently opened Vegas version of the venerable P.J. Clarke's saloon. In NYC, this is an institution, apparently. In Vegas, this is just another "classic, simple bar burger," along the lines of the beloved Bradley Ogden burger. On the Vegas Strip, there are eight million fancy gourmet burger places, and then there are restaurants that serve burgers like this so they can say, "Hey, do you really want another fancy gourmet burger? No, you don't. Eat this simple burger." Emphasis on simple. This thing looks and tastes like the homeburgers my mom or dad used to cook in a frying pan when I was kid. This is not a bad thing. 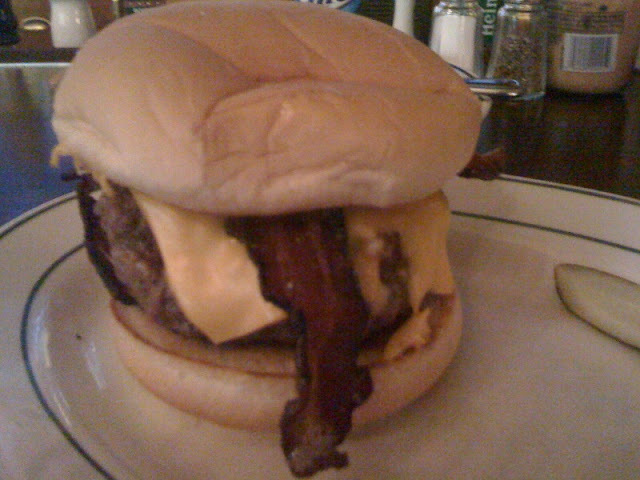 The bun is super soft and squeezable, a nice texture alongside the crispy, thick smoked bacon, melty American cheese and a nice fat patty of freshly ground Angus beef. There's a slice of bermuda onion served on the plate under the burger, which is supposed to serve some purpose but I don't know what purpose is. I didn't eat it. I did, however, wipe some Grey Poupon on the inside of the top bun. It is simple. It is classic. And considering how local foodie critics have drooled over this thing, I am a bit surprised at how simple and homey it is. I could literally go home and make this thing right now. That doesn't mean it doesn't taste good, but it's not really what I want when I order a burger at a bar in a restaurant. Just sayin'.